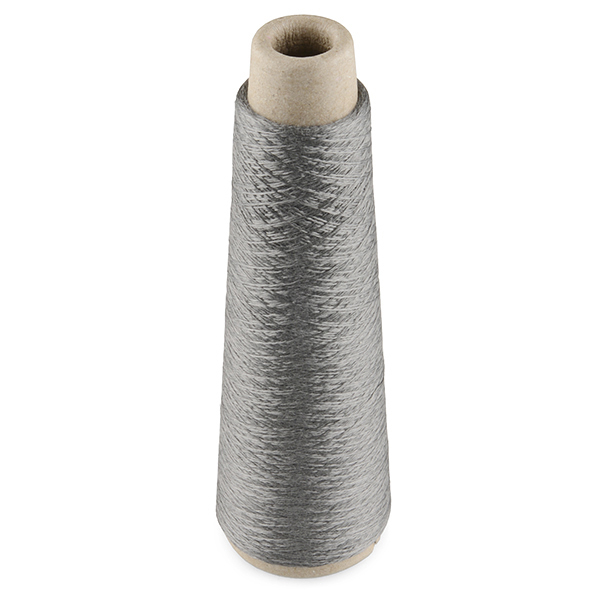 What is the diameter of the Conductive Thread - 60g (Stainless Steel)? Hi! Does this thread support high temperature over time? I am planning to make warm socks heating them up by puting the thread in short circuit with a battery. I have been working with these SS threads for about 4 years now. If using on a sewing machine, once you get it on the bobbin, brush the bobbin liberally with an oil like olive oil and let it soak through. This will help minimize breakage as the SS comes through the foot plate on the machine. Is it the same thread than the bobin? //Edit: In another webshop I have read ~360 yards, is that realistic? can i use this to sew in my backpack..? i have a project to be made and i need to use this thing..answer me asap because i will buy. 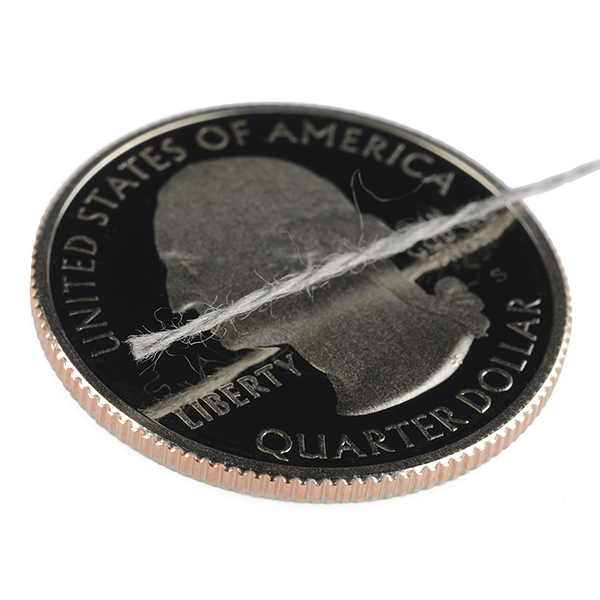 You should be able to use this for pretty much anything you would use regular thread for. Its a little thicker, but as long as you know how to use a needle and thread you should be able to sew this in your backpack. will this thread heat up so that it could be used with thermochromic paints? Anything heats up if you put enough current through it (as long as it is not at near absolute zero temperatures). The question is how much current is required to get it to heat up to a noticeable value. So what the resistance is would be a good question that I would also wonder. Are there any data sheets on this? The resistance is 28Ohms/ft. If you double up the thread, that cuts the resistance in half. Simply doubling up the thread won't work. 2X the tread means more current needed to heat up the thread, I'm not sure how much more current though. Is there a data sheet for this? I'm interested in the current limit. I wonder if this would work for creating lighting stikes if you tie one end to your model rocket? SO glad theres finally an option to buy thread in larger quantities than tiny bobbins! It's a great quantity for working with classrooms and maker spaces, but its tensile strength is somewhat low. Even sewing something simple I managed to break it a couple of times. That's frustrating for me and young people. Sorry to hear that the thread would rip on you from time to time. It's a decent thread, but certainly different and slightly more fragile from your standard spool you might find at a craft store. I have no basis for comparison as this is the first time I have done anything with eTextiles. It works as I'd expect. It can snap if pulled too hard which is mostly not a problem as only the students who sew very messy get tangles. I do find that it is helpful to run the end over some beeswax and then snip the end to thread it through the smallest needle eye. 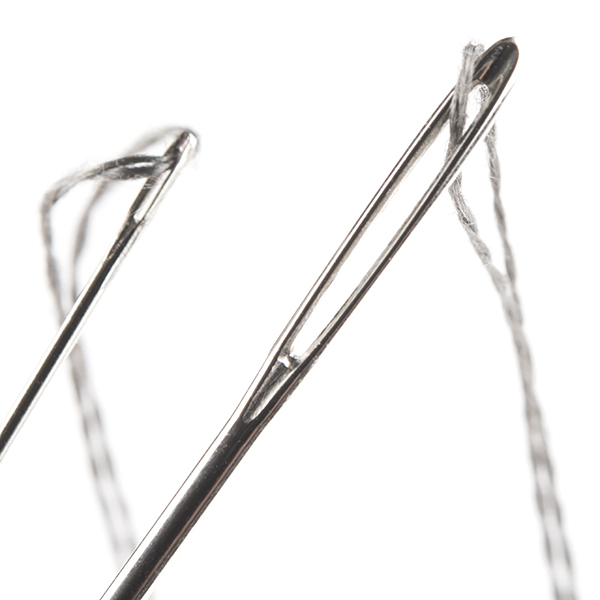 You could just use a thicker needle but for the project we are doing, we need small needles. The students are loving the project and are not complaining about the thread so I'd say it is great. It would be nice to be able to run it through a sewing machine if I were doing a big project but for simple projects, it is great and I am quite happy with it. Our Family and Consumer Sciences teacher says: The conductive thread is fine. I like it. The problem is having middle school students thread it into needles and sew through the sewing holes of the battery holder. I am using the Coin Cell Battery Holder (20 mm sewable) DEV-08822 ROHS. I have discovered size 7 embroidery needles have the largest eyes yet are small enough to fit in the sewing holes of the battery holder. I would love to have larger needles to make it easier to thread but then they are too big to sew with. Having 100 seventh and eighth graders thread needles was really tough. This time I am having 75 students do the project. So, I have purchased "easy threading needles - sizes 4-8" that have a slot in the top to just pull the thread down into the eye. They will fit in the battery holders. They are much more expensive needles. By next week my students will try them and I will know more about whether or not students can thread them and use them easily with the battery holder. All needle threaders I have tried simply break when students use them. Do you have a different kind of battery holder that would substitute for this one and help solve my problem? I am having a lot of fun making LED sewing projects with the students and need to expand my knowledge! I don't know that it's the best thing, but it's up there! My first E-textile was a success the first time around. I purchased a roll for the maker club I run and it worked great the kids had a lot of fun making everything from light up bracelets to bow ties. This thread is working well on my wearable art project. Highly recommend!